Hunter S. Thompson created something of legend of himself. A lot of people, myself included, know him primarily from his most popular books and/or the movies that some of them got turned into. The original gonzo journalist was seen as a drug-addled, ranting maniac whose ramblings were just coherent enough to make sense if you shared his socio-political leanings. Of course, that's not the whole truth since it tends to focus on only about a decade of his life. Which helps his iconic status. It's a finite enough period of his life that Thompson is never seen as a person who grows and changes with age. He's perpetually stuck in his mid-30s. Young enough to still be wild and rebellious, and old enough to have some life experience. It's also not the whole truth because those books that he's known for are fiction. Based on real events, sure, but re-plotted, re-organized and re-written by Thompson after the fact. He was, by those who knew, actually quite meticulous about word and phrasing choices. He edited himself quite a bit, despite the end product looking like the off-the-cuff ramblings of a madman. So, who was Hunter S. Thompson? 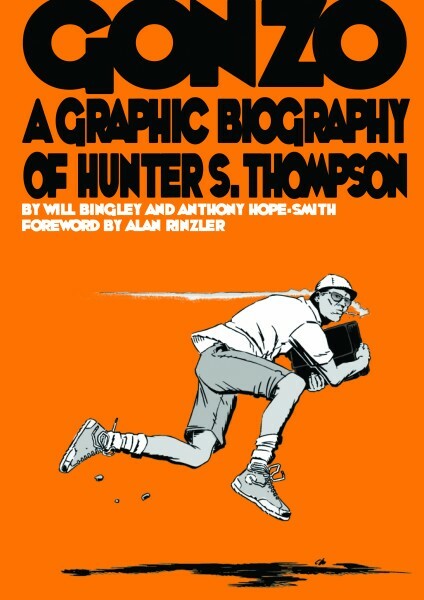 That's where Gonzo: A Graphic Biography of Hunter S. Thompson comes in. 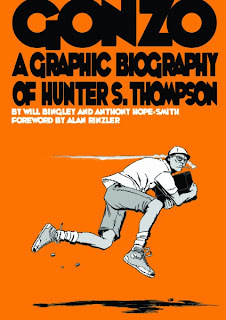 As should be evident by it's title, the book by Will Bingley and Anthony Hope-Smith is a biography of the writer told in a graphic novel format. Bingley seems to have done his homework. The foreword is by one of Thompson's former editors/collaborators, Alan Rinzler, and he endorses the history this book presents. He wasn't around for all of it, of course, but those parts that he didn't witness seem to ring true. The book cover Thompson's entire life, from birth to grave. Not unlike Thompson's own writings, the book starts with something of a barrage of mixed images before it coalesces into a cohesive narrative. This seems deliberate and works to good effect. Once the book gets the main story underway, it flows in a very Thompson-esque manner, picking up on the particular cadence of his language, but only appropriating it directly on occasion. I was a little concerned at first that the book would be told almost expressly through narration boxes. This almost always comes across to me as someone writing a prose book and just setting pictures to it without any real consideration for the graphic novel format. But that fades away quickly once you get past the prologue/introduction/whatever-you-want-to-call-the-first-30-or-so-pages-of-the-story. From there, the books reads as a piece of sequential art should, with the art and text both enhancing and reinforcing one another. The art surprised me a bit in that, despite having a seemingly loose style, Hope-Smith portrays Thompson very consistently. Even accounting for his aging a full lifetime over the course of the book. The reader is never at a loss for recognizing him, regardless of how much hair he has (or doesn't) or how many wrinkles he's gathered. Other characters tend to flit in and out of his life, so there's no real issue with determining who they are, and many of those are clearly, but not obtrusively, identified in the text. I definitely have a greater appreciation for what Thompson did, even though I don't agree with all of it. Bingley and Hope-Smith did a great job of portraying Thompson's chaotic life and character. I would only hesitate with a high recommendation because of the subject matter itself; Thompson does tend to be a polarizing figure and I suspect those who simply don't like him or what he stands for -- or, more accurately, what the icon/legend that represents Thompson stands for -- would not be able to get past that to find out what makes him tick. I mean, if you're going to do a biography of Hunter S. Thompson, you're going to inevitably paint an ugly picture of Richard Nixon, after all! But I enjoyed the book, and got a lot out of it. Probably more, in fact, than I got out of Thompson's most famous books.